He'll be back. And we aren't going to have to wait all that long for him to return. 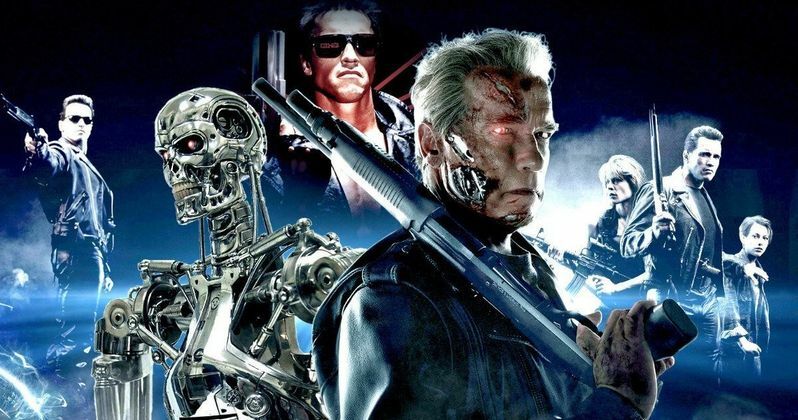 Tim Miller (Deadpool) is directing Terminator 6 with creator James Cameron on board to produce, which marks his first official involvement in the franchise since Terminator 2: Judgement Day. Now, Paramount has officially given the new Terminator movie a release date. We're going to see Arnold Schwarzenegger return once more in the summer of 2019. Paramount Pictures has just announced that Terminator 6 will arrive in theaters on July 26, 2019. That may sound like a relatively quick turnaround, but it was recently revealed that Tim Miller and James Cameron have been working on the reboot behind-the-scenes for almost eight months now. So this is a project that has been in motion for a while, despite the fact that we're all just now learning about it. The plan is, if this first new Terminator movie goes well, is to have this movie kick off a brand new trilogy of movies. That was also promised with Terminator: Genisys and we saw how that turned out. So let's not get too ahead of ourselves just yet. The last few Terminator movies have been a disappointment, to say the least, and everyone involved in this new reboot understands that. It was recently revealed that Terminator 6 is going to be a sequel to Terminator 2 and it will ignore everything beyond that. James Cameron says that Terminator 3, Terminator: Salvation and Terminator: Genisys are all going to exists in a completely different timeline. Luckily, since the franchise deals with complicated time travel, they can probably find a way to do that so it at least makes a little bit of sense. At this point, fans just want a good Terminator movie and they're likely to forgive some timeline adjusting to make that happen. Terminator 6 also has some things working in its favor that the last few movies in the series didn't have. For one, as mentioned, James Cameron is back and, even though he is neck-deep in production on his four Avatar sequels right now, he seems to be pretty heavily involved with the new Terminator movie. Not only that, but he also managed to convince Linda Hamilton to reprise her role as Sarah Connor for this new movie, which is a huge deal. That means Hamilton, Schwarzenegger and Cameron are all back together for the first time since T2, which is still considered by many to be the best movie in the series and one of the best sequels ever produced. With the summer 2019, release date, Terminator 6 is poised to be one of the major releases of the summer movie season that year. It should begin shooting in early 2018. It's been a really long time since a Terminator movie blew the doors off the box office, with none in the series having topped Terminator 2: Judgement Day, which brought in $519.8 million back in 1991. Can this Tim Miller reboot finally be the thing to get one of the best sci-fi franchises in the history of cinema back on track? Let's hope so. For now, mark down July 26, 2019, on your calendars and count the days, everyone.